Sony ICF-2001D wereldontvanger met teak wandhouder - Advitek Marine Systems A.M.S. B.V.
Sony ICF-2001D wereldontvanger met teak wandhouder. B-stock Goede Staat. 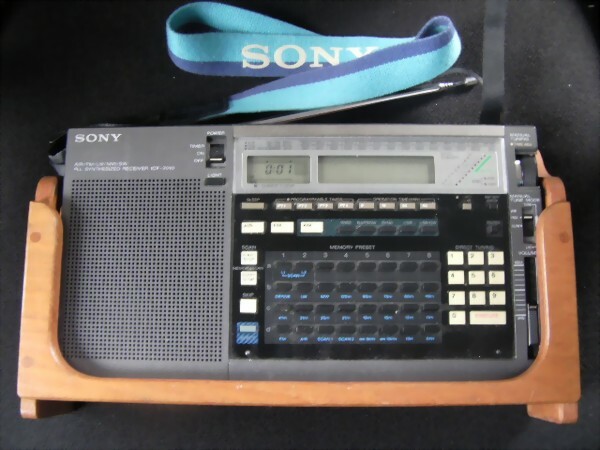 The ICF-2001D was a portable solid-state LW, MW, SW and FM receiver, also known as a world receiver, made by Sony in Japan around 1980. Although it was a commercially available civil-class receiver, used by many people world-wide, it played an important role in international espionage. The ICF-2001D measures less than 29 x 16 x 5 cm and is powered by two AA-size cells and three D-size cells. It has a built-in telescopic antenna at the top and a digital readout at the front. The device is commonly operated on its back, tilted by a bracket at the rear. This gives the optimum viewing angle for the LCD display. The ICF-2001 can be powered by an external 4.5V DC adapter, or by the internal batteries. Alternatively, a 12V adapter cable was available to allow the radio to be used in a car. It was available in 3 different basic versions (types) . Sont ICF-2001D Furthermore, there were at least five country-specific models, each with their own frequency ranges. The device fully covers the LW and MW broad­cast bands in AM, plus the VHF FM broad­cast band (87-108 MHz). But the actual purpose of this radio is the Short Wave band (SW), that is available as one contiguous range from 2250 kHz to 30 MHz (26.100 MHz on some models). The ICF-2001D was succeeded in 1983 by the ICF-7600D, and in 1986 by the slightly improved ICF-7600DS, both of which have a general coverage from 153 kHz to 30 MHz (except for the German version which stops at 26.100 MHz). They were also popular in the espionage tradecraft.